MakeFashion began as a side project between a trio of Calgarian friends in June 2012 with the aim to explore the potential of bridging the gap between fashion and cutting-edge electronics. The show introduces designers, engineers, and makers to the exciting world of wearables through a series of informative, designer-lead workshops. During these four years, the show has produced over 30 wearable tech garments, and showcased annually at their own gala in Calgary, Canada, and at over 20 international events in fashion capitals such as New York, Rome and Shenzhen. Thanks to all who submitted to MakeFashion 2016. Our submissions are now closed, we received over 20 project proposals. This year, our submissions will be competitively curated by a panel of esteemed industry experts. Our panel includes previous MakeFashion designers, including Jeff De Boer and Dr Patricia Flanagan, as well as international industry experts. We will be announcing selected projects mid-september. See our 2016 curation panel. http://www.makefashion.ca/wp-content/uploads/2015/06/10629271_10153198422771926_7757427395783389335_o.jpg 767 1150 Chelsea Klukas http://www.makefashion.ca/wp-content/uploads/2016/03/makefashion_logo.png Chelsea Klukas2015-09-04 00:35:202015-09-04 00:35:20Meet our 2016 Curators! Rev your creative engines: we are excited to announce that the 2016 MakeFashion Call for Entries will open on July 15th. MakeFashion will be accepting international entries for our spring 2016 gala. Entries will be competitive based on technical innovation, creativity, and originality. We will also be announcing our panel of esteemed curators/judges on August 1st including industry leaders from across the globe. Requirements for entries will be announced on the 15th and will include technical descriptions, cost estimates, and a concept sketch. The deadline for submissions will be August 15th. In the meantime, gather your teammates and start brainstorming by browsing our previous projects for inspiration. We are looking forward to the next round of groundbreaking wearable tech for MakeFashion! 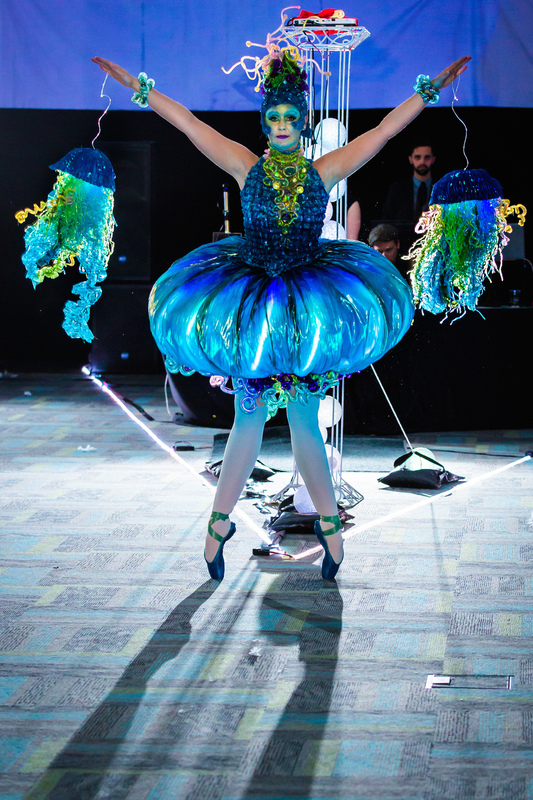 MakeFashion is a creative wearable arts organization committed to bringing wearable technology to the runway and making it beautiful and inspiring. We are a volunteer-run non-profit organization headquartered in Calgary, Canada and Seattle, WA. We are currently offering a Community Builder intern position. Deadline for applications July 1st 2014. – Enthusiastic about creativity, arts, and technology. – Creative input on event planning for fundraising events and symposiums. – Direct mentorship from the organization co-founders including Shannon Hoover, Art Gallery owner and director of Calgary Maker Foundation, and Chelsea Klukas, experienced startup designer, public speaker, and current designer at Amazon. This is a volunteer work experience internship. Internship will take place for approximately 3 months, but is flexible based on candidate’s availability. Internship will be part-time, up to 10 hours per week based on availability. Interested candidates contact info@makefashion.ca with resume and/or CV before July 1st 2014. MakeFashion Spotlight is an insider’s look on our 2014 gala pieces. Follow us as we showcase each of our designers and the inspiration and technology behind their work. Photos by Edward Ross photography. “I was born in London, England and moved to Calgary with my parents when she was was five so I guess you could say I grew up in Calgary. After high school I moved around a lot spending time on both the East and West coasts of Canada. I moved back to the Calgary area in 2003 and now live in Black Diamond, a small town south west of Calgary. What I like about Calgary is the mountain views, our western heritage, the Chinook winds, the creative innovation that seems to be present here in all sorts of art and business ventures. I first began working with wearable technology when I was working in film in Vancouver. 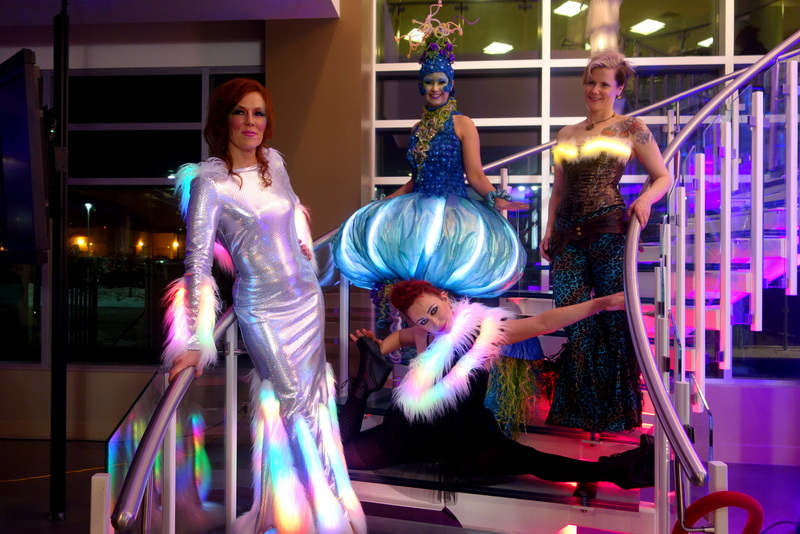 My first exploits involved incorporating LED’s, fiber optic fabric and animatronics into special effects costumes. In 2012 I was designing costumes for the 100th anniversary of the Calgary Stampede and we did a number of costumes that involved LED’s and Arduino micro-controllers for the evening Grandstand show. I found out about MakeFashion in 2012 when I went to a Meet and Geek at Protospace. I was in the midst of building the costumes for the Grandstand show and was really excited about all the new technology that was coming out and wanted an R&D project to work on to further this. I designed the Chameleon Cocktail dress for the first MakeFashion show in January 2013. Photo by Edward Ross photography. The biggest inspiration for the 2014 piece was Jellyfish. I wanted to create a wearable art piece that reflected the essence of a Jellyfish. Technology in the piece included Fiber optics, Litex LED ribbons, Lilypad arduino, individual RGB LED’s, LED strip lighting, Synthesia custom LED controller, and rechargeable Li-Poly batteries. When starting a piece I like to do a sketch of what I want the final piece to look like and then work to achieve that goal. When we started Medusa Fabulosa there was myself, Vlad Lavrovsky (the technician) and a glass artist involved. My sketch came out of a couple of discussions between the three of us last spring. We had looked at a number of materials and techniques that we wanted to use in the piece.Unfortunately the glass artist became really ill and had to bow out of the project but Vlad and I stuck to the original concept and I tried to find ways to still incorporate glass or glass-like pieces into the work. The outside fabric was dyed and/or airbrushed to get the effect I was after. 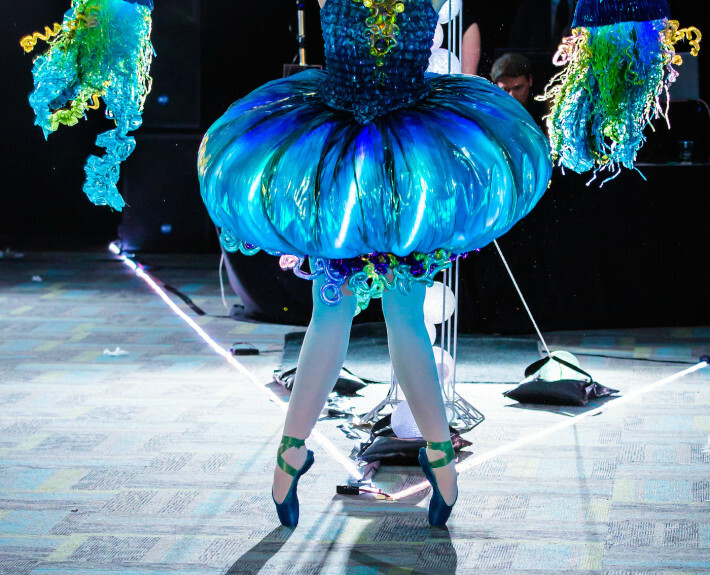 The prop jellyfish and headdress base were heat shaped and molded from thermoplastic fabric and then decorated. The neckpiece was made from knitted copper wire, glass pieces, marbles, beads, crystals and ribbons. Creating the inner frame for the Jellyfish skirt required some engineering as this was also going to support all the LED strips we were using for lighting the skirt. I also wanted the skirt to “bounce” so it took a couple of mock ups to perfect the “bounce” factor. One of the hardest things to predict is what will go wrong. There is always something that comes up that does not go as planned and it seems like one of the biggest challenges is dealing with this or trying to find an alternative usually at the last minute. I knew from the beginning that I wanted a dancer on pointe to model the piece and present it in more of a theatrical dance performance on the runway. Working on this piece I learned that there are never enough hours in the day! For new designers, I recommend to research, experiment with materials and techniques, go to Protospace and the workshops offered at Endeavor Arts. – Angela Dale, returning designer for MakeFashion two years in a row. The 2014 MakeFashion gala brought to you by OnConference in March 2014 had over 400 attendees and showcased an inspiring collection of local and international wearable technology. E-mail info@makefashion.ca for information on how to become involved as a volunteer, designer, tech enthusiast, or sponsor. MakeFashion Spotlight is an insider’s look on our 2014 gala pieces. Follow us as we showcase each of our designers and the inspiration and technology behind their work. Photos by Justin Poulsen and Edward Ross photography. Elle Nguyen, creator of “Dragon Queen” with Aman Dhalay was born and raised in Calgary. I discovered MakeFashion when a writer from my online blog team attended the last show. This was my first year participating in the event. Dragon Queen by Elle Nguyen and Aman Dhalay of Javeda. Photography by Edward Ross Photography. The dress designer and I drew from our own cultures to create a fusion of Chinese and Indian styles. Aman and I sat down to create design and came up with a quick idea, inspired by the creative designs of past Victoria Secret Wings on the runways, but were unhappy with it. We created another design that was closer to the Javeda brand – a bridal design. Then we met up with Yeats Wong of Yeats Magic Co, an illusionist who has built some of his own illusions to come up with a more interactive design. He also helped with deciding what materials to use to keep the design lightweight. One of the most interesting technologies used in Dragon Queen is a mobile application can be downloaded from the EZ-Robot mobile website and installed on any mobile device. Then, when the mobile device connects to the dragon via WIFI, the mobile device can control the movements of the dragon. The initial movement was powered by flexinol. I had purchased a learning kit but when I applied the concepts to the dragon, the movement was subtle and I was worried that it would not be noticeable from the runway. Then, Shannon Hoover teamed me up with Jeremie of EZ-Robot and then the movements for the dragon became perfect. – Elle Nguyen, first-time designer for MakeFashion. Read her recap of the event here. The 2014 MakeFashion gala brought to you by OnConference in March 2014 had over 400 attendees and showcased an inspiring collection of local and international wearable technology. E-mailinfo@makefashion.ca for information on how to become involved as a volunteer, designer, tech enthusiast, or sponsor. Kathryn Blair and teammate Ryan Blair, creators of “Common Experience” are both from Calgary. “I like that the maker and art communities in Calgary are very open and easy to get involved with. It’s also a city that’s changing a lot, and it’s exciting to be a part of that. I came to work with wearable technology via physical computing, which I’d worked with for some art work in the past. My first wearable project was for MakeFashion 2013. It was called “Somatic System” and it was a coat that used a temperature sensor and a pulse sensor to monitor the wearer’s mood. It would then change colour and play music to correct (calm) a bad mood, or maintain a good mood. You could totally commercialize a headband that would tell the world how much attention you’re paying, but it would be so scary! I’m very interested in biofeedback and exploring the intersection between mind and body – it’s so easy to think about your mind as a separate entity from your body, and easy to think about your mind in other context – identifying with other people, imagining what it would be like to be different. That’s totally vital for our ability to empathize with others. But our minds are a part of our bodies, and our bodies have a huge impact on how we think and feel, both the physical reality of our brain, and the physical reality of other parts of our bodies, and of course external stimuli also impact our brains. I love exploring those intersections, and wearable technology and EEG provides an amazing set of tools to do that. Kath Blair models “Common Experience”. Photo by Edward Ross photography. When building Common Experience I worked with my husband, Ryan Blair, to figure out how to execute. I tend to get an idea and execute, and my revisions tend to be in the specifics and how I’m executing, rather than the idea overall. So of the basic idea, there was pretty much one draft. Of the specifics, there were hundreds of revisions of exactly how we should do things, how it should look exactly, what it should be made of. Many of the deciding factors were practical – will this work? Will it look good? Will it move the way I need it to? I come at this more from a visual art background and having done programming and physical computing before, so I serve as my own technical support on the programming side, and my husband Ryan is great with electronics. I also got some help from Dave at Solarbotics, and on the fashion end, from Julia Wasilewski, a costume designer. Rather than use a model, I chose to wear the piece myself! I was very focused on getting down the runway okay and trying to keep my timing decent. I like to model my pieces myself because for me it’s kind of about that relation / intersection between wearer and garment. We had a great movement coached who helped me figured out a way to model it theatrically. She was great and very helpful! Using the EEG (the input sensor) is the real wow factor of the piece. It’s so amazing that you can buy an EEG for $130 and read the data from it and use it to make crazy projects – nerf guns that fire based on your brainwaves, for example (http://hex-machina.com/hw/mindbullets). 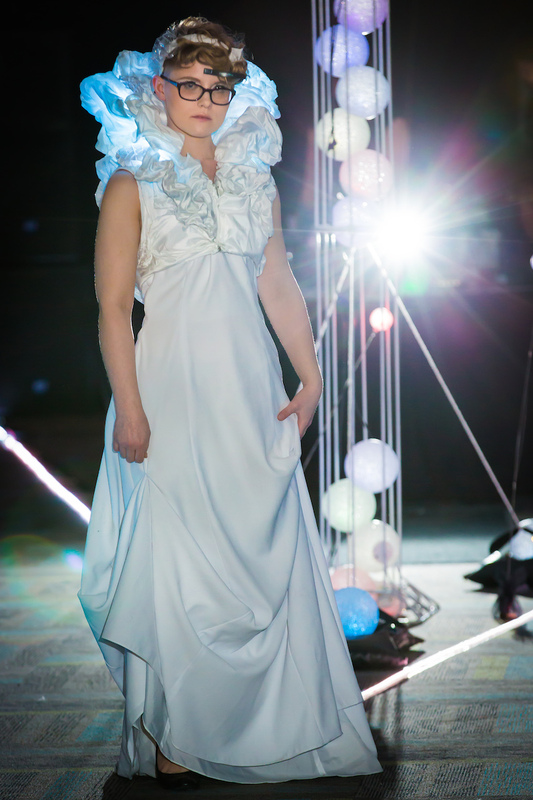 I used the EEG output – the attention level of the wearer – to control the colour of the lights on the garment, as well as to move servos, which pulled origami deployable structures into different states of tension. This year I learned a lot of programming and I’ve never worked with servos or Raspberry Pi (or linux) before, but I think one of the most useful things I learned was about my personal process – I love to play with materials and test out different options, and I can put off making decisions (and spending significant money on materials) until I absolutely have to make that decision. My advice to new designers is to play with whatever technology strikes your fancy. Never wonder if you can accomplish something – see if you can find a way to do it before you dismiss it. I think a lot of the body-monitoring biometrics is starting to become big, and starting to integrate, and I think that will get really all-encompassing and able to make better inferences about your body’s state and suggestions about what you should do, and it will be popular among the very health-conscious. You could totally commercialize a headband that would tell the world how much attention you’re paying, but it would be so scary – who wants everyone to know if you’re not paying as much attention as they would want you to? I hope that doesn’t happen, so big-brother-ish. You can reach me via my website, http://glass-slipper.net, or on facebook at http://facebook.com/kath.blair, or on twitter at @kathblair. – Kathryn Blair, returning designer for MakeFashion two years in a row. Shannon Chappell (the maker) is from Prince Edward Island, and Kayna Hardman (the seamstress) is from Calgary. We both now reside in Calgary. What we like about Calgary is the lack of division between different disciplines, which makes teaming up with others more about creativity and less about competition. I have been working with costume design for around 3 years. In my costumes I had always tried to achieve some level of realistic functionality with them; for the most part I would incorporated LEDs and minor switching functions. I had created a Cyborg costume that had numerous parts that lit up and pulsated, as well as a hand and eye piece that open/closed and turned off and on via mercury switches. The inspiration for our 2014 piece “The Widow” was primarily the black widow spider. 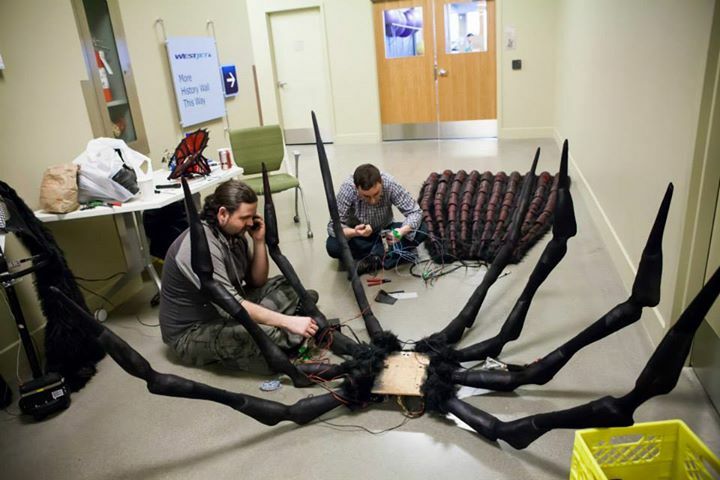 Incorporated into this idea was the idea of spider sense, motion detecting and the control of large spider legs. Also we wanted to tap into peoples fear of spiders and to achieve that through a very creepy stylized dress. Ultrasonics- to create a wave of light across the train as someone passed by it. Vibrating Motors- to give the model a sort of spider sense as to when someone was behind her. Robotic/servos- to move and operate the legs. Flex sensors- integrated into the models glove to operated the robotic spider legs. The concept and draft came partly from a photo that I had for years of a woman with giant spider legs growing out of her back. But most of the idea came from waking up in the middle of one night with the idea in my head, drawing it out, and then making sense of it the next morning. Only one draft was made and we tried to work as close to that as possible, to remain true to the vision. The deciding factors when finalizing were mainly to do with what were the technical limitations based on the design and the ability to properly integrate the design and tech together. Many parts of the dress were made from salvaged materials. Like place mats, pingpong/christmas globes, a golf glove and lamp parts. The train was made out of gutter mesh and party streamers. A special bustle was made that was on rollers to help support the weight of the legs and train. Most of the dress was a challenge. A lot of the materials and electronics that went into were a first for me. This was the first time I used robotics and more involved electronics. Also I generally built by myself and this time I had to learn to work with a team. Other challenges were to make such large legs that worked with minimal wobble based off a light weight design. Also weight was a constant problem, to which we had to come up with many different ideas on how to redistribute the weight comfortably over the models body. This was the first time I had brought in outside help on one of my creations so it was a learning process which was helpful especially when learning on how to relay my vision to other people in a way they can understand so we can be on the same page. I worked with Kevin Loney and David Bynoe to complete this dress. Kevin designed and built all the tech for the dress and David was the one who designed and built the robotic legs for the dress. Under a tight deadline we all came together and achieved great things even under pressure. The home for this dress I feel would be in a movie, some sort of cold dark cavern. Something that plays off the eerie nature of it and the fear it instils. Something I learned from MakeFashion was to make deadlines and and try your hardest to achieve them. Stay in constant communication with the other members of your team and help each other as much as you can. My advice for aspiring wearable tech designers is to start with a big grandiose vision, go all out and try to achieve that, then work your way down to something that is manageable. Always be pushing the boundaries of what wearable tech is and could be. 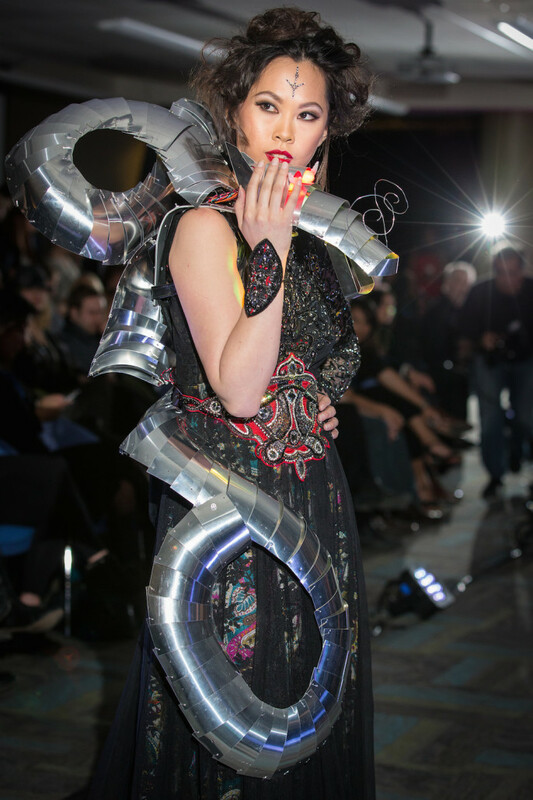 -Shannon Chappell, first-time MakeFashion designer participating in the 2014 gala. Thanks for an Amazing 2014 Gala! Thanks to everyone who attended, sponsored, supported, and volunteered for our 2014 MakeFashion gala. We were thrilled to have over 400 attendees at the WestJet Campus. http://www.makefashion.ca/wp-content/uploads/2014/03/DSC04334.jpg 1067 1600 Chelsea Klukas http://www.makefashion.ca/wp-content/uploads/2016/03/makefashion_logo.png Chelsea Klukas2014-03-05 04:35:412014-03-05 04:35:41Thanks for an Amazing 2014 Gala!